Release date: 09/19/2011.Language: Russian, English. background of the current theme. so the screen you will see nothing. - Sound file - choose *. 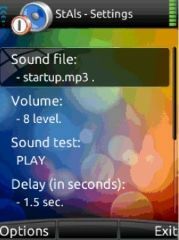 mp3 file. - Language - no comments. -> Tuner was a bit faster to run. StAls v4.17 Symbian 9.1-9.3 Symbian 9.4-9.5 Touch Unsigned URL http://symbian2share.blogspot.com/2011/09/stals-v417-symbian-91-93-symbian-94-95.html. NEXT.